Get your tickets to Minnesota at the Hangar 3/11! In celebration of it’s new record label launch, Papillon Pavilion Records is bringing renowned producer Minnesota to Miami for a set at the Hangar on Saturday, March 11th! 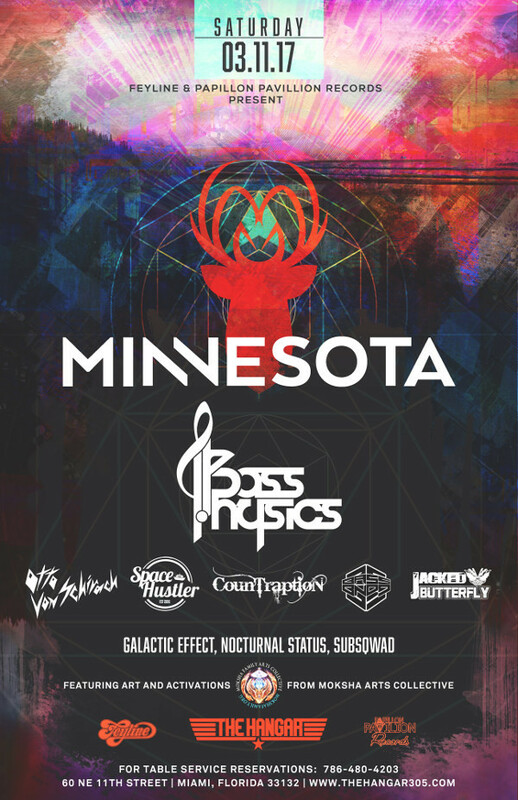 Minnesota will be joined by Colorado-based producer Bass Physics plus a showcase of Papillon Pavilion Records artists! More than a record label, it’s a movement. PPR is a pipeline for songs, sounds and sights that have never been experienced before. Utilizing ground-breaking technology in live performances to engage the audience in every show, PPR is set to be a revolutionary force in the music industry. From its inception, the artistic collective known as Moksha Family has been a nexus of cultural and artistic expression. Comprised of artists, musicians, technicians, and visionaries, we celebrate the mystery that unites us with an eclectic mix of performances by individuals and groups from the local and international communities. Denver-based producer Arja Adair’s main objective is to spread positive vibes through the power of music. His genre-bending sound is made up of soulful electronic beats fused with live guitar and keys, resulting in both beautifully expressive sonic landscapes and songs that explode with power.